Governor Doyle announced that Milwaukee will be getting $784,000 to extend the Beerline trail from where it currently terminates at Keefe and Buffum north to Capitol Drive. The money will be used to purchase the former railroad right-of-way and construct a multi-use asphalt path from Keefe to Capitol Drive. The section of the Beerline Trail connecting Gordon Park to Riverboat Rd was recently completed and by all reports is very well used. This is the last remaining section of the old rail line. It will connect serve as a separated bicycle and pedestrian connection within the neighborhood as well as connect Riverwest residents with all the shopping and employment on Capitol Drive. In a small way, maybe a trail will help spur Bicycle Oriented Development at the old Tower Automotive site. 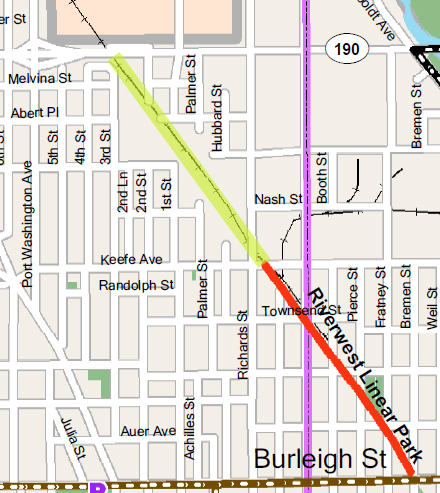 The red area is the existing Beerline Trail that is undergoing a landscaping project now. The green is where the extension will be. I am new to daily bike commuting, but in the 4 months I have been doing it the improvements have been amazing. Beerline is a great path. I really appreciate all the thought and effort that has gone into making commuting safer (and may have had my life saved in the process). Nice, this is great to hear. This should help get more people on the trail, particularly since this stretch looks to be much more contiguous than the ‘older’ one (south of Keefe). Even though this leads almost directly to my office, it is considerably slower than the streets, because of the awkward intersection traverses and the big gap south of Burleigh. The new stretch south of Gordon Park is a veritable freeway though. Great work to everyone who pushed for this.